Alright, I'm filing this one under brilliant pet products. It's a super cute window through your fence, meant to give your confined dog (cat/child/whatever) a view of the rest of the world. The Pet Peek is a 9.5" half sphere window designed to give your dog a full view of whatever going on on the other side of the fence, reducing barking and curious digging. 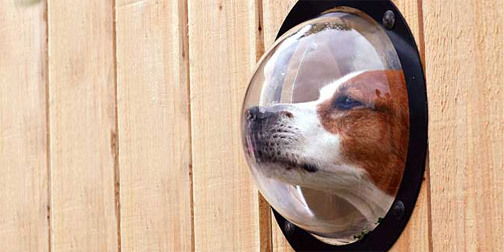 I think it would make my day to walk by somebody's house and see their space cadet dog peeking out through this perfectly head shaped window. Love it! (Found most recently through the Sub-Studio Design Blog).